So there’s a lot of groundbreaking work going on in the climate sciences right now. And a major focus is evidence that winter polar warming events are increasingly connected to blizzards and storms in places like Europe and North America. Storms that are both historically powerful and that occur with greater frequency. 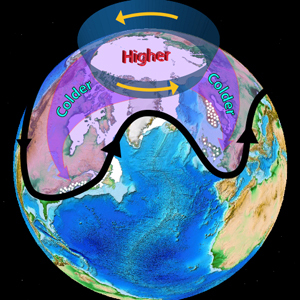 Recent boreal winters have exhibited a large-scale seesaw temperature pattern characterized by an unusually warm Arctic and cold continents… Using a recently developed index of severe winter weather, we show that the occurrence of severe winter weather in the United States is significantly related to anomalies in pan-Arctic geopotential heights and temperatures. This is a rather big deal for a number of reasons. First, it’s an observational confirmation of earlier scientific work predicting just these kinds of extreme weather instances due to polar warming and related climate change. Second, it’s another indicator that human-caused climate change is pushing us into a period of much stormier weather for the North Atlantic region during fall and winter. With the new NASA global temperature data set out, I thought we’d take this opportunity to apply a bit of context to apparent stormy changes we see at present in winter weather patterns. The first bit that I’d like to be crystal clear about is that the Arctic, overall, has become much, much warmer than usual during winter. That this warming spike occurs in the context overall global warming. And that this polar warming is increasingly associated with severe weather events in the middle latitudes and especially over the land and North Atlantic mid latitude zones. The above graph shows polar temperature anomalies from the surface (1000 mb/2 meter) of the Earth to the top regions of the atmosphere (10 mb/25 kilometers). 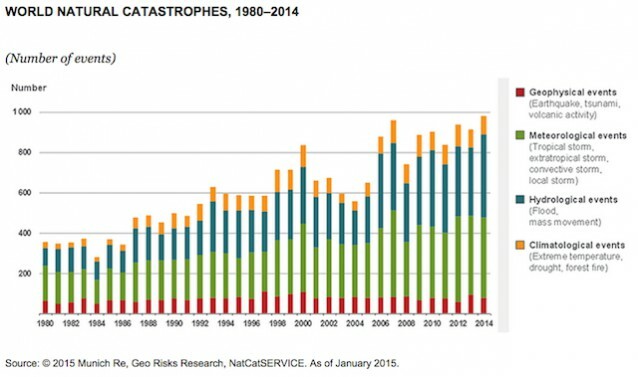 Along the bottom of the graph, we have a list of extreme weather events. Analyzing the graph we find that major polar warming associated with extreme temperature increases at the bottom of the atmosphere all the way through to the stratosphere correlate with recently more frequent historic blizzards and nor’easters in the regions mentioned. In previous posts, I used the ground-breaking scientific research of Dr. Jennifer Francis and others as a basis to analyze how energy transfer into the polar zone in the form of heat build-up has generated these extraordinary temperature extremes. How this ramping heat is associated with polar amplification — an aspect of human-caused climate change. 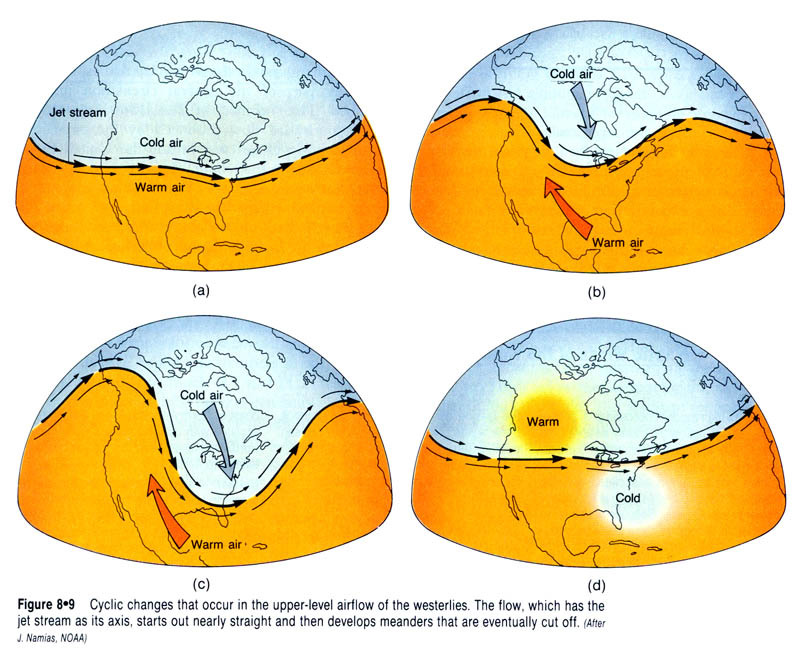 And how these warming events can have upstream (Jet Stream) impacts that increase storminess in the middle latitudes. But let’s take this analysis a step further to look at, as January progressed into February, where it got warmer, where it got colder, and where the big storms fired off. The maps above show global temperature anomalies (NASA) for January (top) and February (bottom). And looking at those maps we find that the polar region heated up significantly from already warm ranges of 4 to 6.9 degrees Celsius above average during January to an amazing 4 to 12.3 C above average during February. As this relative polar warming increased during February, the NASA maps show that colder than normal temperatures expanded over North America through Canada and parts of the Northern U.S. even as a cold spell began to blossom in Europe. Cold pools that were fed by Arctic air shunting southward as the Polar Vortex collapsed and remnant continental troughs emerged. NASA’s zonal anomaly measures provide further evidence for this trend. For here we find that as temperatures spiked from 4.5 degrees Celsius above average in the polar region of 80 to 90 degrees north latitude during January to an amazing 11 degrees above average during February, the region of 45 to 70 N dipped from 1 to 3 C warmer than average to 0.8 to 2.5 C warmer than average. Note that the zonal middle latitude continental cooling is moderated by both the relatively warmer oceans and by very strong ridge zones running through these regions. But that the trough regions over both Europe and North America produced locally frigid temperatures and related instances of extreme weather. Putting all these maps together from top to bottom we find that the polar warming events coincided both with mid latitude cooling even as we saw extreme snowfall in Canada and Montana, historic cold and snowfall in Europe and the UK, record flooding in the Central U.S., and record heat along the U.S. East Coast. We also find that the developing deep trough over Canada due to the expulsion of polar air southward in turn produced the succession of instabilities that would later spawn 3 very severe nor’easters off the U.S. East Coast during March. Of course, all of these severe weather events are happening in the context of months that are around 1 degree Celsius warmer than 1880s averages globally. That January was the fifth hottest on record and that February was the sixth hottest on record during a La Nina that, all things being equal, should cause the world to be cooler than average. But as we can see clearly here, all things are not equal — human-caused climate change is a big spoiler. Winter and spring of 2016 saw very warm temperatures in the northern polar region of our world. There, Arctic sea ice extent maximum hit its lowest values ever recorded in March. During summer, cooler, cloudier conditions prevented a complete meltdown by the time of sea ice minimum in September. However, sea ice extent bottomed out at second or third lowest on record in most of the major monitors. Moving into October, November and December, Arctic sea ice failed to refreeze at typical rates as extraordinarily warm temperatures were reinforced by pulses of air rising northward from the middle latitudes. At times, the gap between previous record low years and the new record lows seen during November of 2016 were as much as 1.1 million square kilometers. Now it is practically certain that average sea ice extents throughout 2016 will hit a new record low overall. Much of this melt was almost certainly driven by the record warm Arctic temperatures seen during 2016. And according to NOAA, this year shattered all previous high marks for Arctic heat by a big margin — hitting 3.5 degrees Celsius warmer than 1900. Overall, this rate of warming is at least twice as fast as the rest of the globe. And all this extra heat has not only had a significant and substantial impact on sea ice — it is hammering the Greenland ice sheet, forcing the permafrost to rapidly thaw, and increasing the incidence of algae blooms related to ocean acidification. In Greenland, the average annual rate of land ice loss is now 230 billion tons per year. This despite the fact that warming in the Greenland and Barents seas is helping to drive increased rates of precipitation in Eastern Greenland. So far, much of the precipitation is coming as snowfall. And this increase is helping to mitigate some of the mass losses due to melt across Greenland (see Marco Tedesco’s comments in the video above). However, as Greenland continues to experience surface warming, precipitation is likely to come more and more as rain — which will only further help to accelerate melt. NOAA also notes that added Arctic heat has substantially altered the permafrost. Increasingly, this region of frozen soil is given over to thaw. As a result, profound changes to the Arctic landscape are ongoing. In wet regions, the permafrost is giving way to thermokarst lakes. In drier zones, the moisture that was locked into the soil and preserved by permafrost is being steadily lost — which is one of the primary drivers of drought and related wildfire hazards now being experienced in Canada, Siberia, and Alaska. Overall, the permafrost is emitting more and more methane and carbon dioxide as it melts and as microbes in the thawed soil activate. And consensus science now indicates that, on balance, this thawing ground is now emitting more carbon than it is taking in. This is a step change from its previous state — when the frozen land acted in concert with the boreal forests as one of the world’s primary carbon sinks (please also see: Beyond the Point of No Return). During 2016, the Arctic also saw a continuation of large algae blooms popping up in regions near the receding sea ice edge. This happens as high nutrient waters liberated by ice allow sunlight to produce a riot of plankton and algae growth. These minute life forms take in atmospheric carbon. But as they die, they transfer this carbon to the ocean. As a result, and as Jeremy Mathis noted in the press briefing this morning (see video above), Ocean acidification increases. The above indicators present a picture of an Arctic undergoing rapid climate destabilization. As a result, everything from weather patterns, to the rate of sea level rise, to Northern Hemisphere growing seasons are likely to see some impact from these Arctic changes over the coming years and decades. In addition, loss of sea ice and likely harms to life in the Arctic Ocean due to warming, habitat loss, and ocean acidification will remove food sources for local communities. NOAA researchers identify some potential positive outcomes — such as increased commerce, ship traffic, tourism, and mineral extraction. But it is difficult to see how these supposed positives do not further exacerbate an already difficult to manage problem. Increased commerce, ship traffic and tourism threaten to harm already stressed habitats and animal populations. In addition, if new fossil fuel sources are exploited in the region, it will only add to the currently severe problems presented by warming. As a result, there is a high likelihood that the net impact to the region will be starkly negative as species are threatened or go extinct and numerous communities are lost to the rising seas, destruction of environmental resource bases or endangered by worsening fires. Denying The Neverending Heatwave: NASA, NOAA, JMA Show 2014 Broke New Records; But Will Republicans Ever Listen to Science? Strong global temperature records typically show up in all the major climate monitors. And, despite no El Nino providing an added kick to atmospheric heating, that’s exactly what happened in 2014. Respectively Japan’s Meteorological Agency (JMA), NASA and NOAA all showed 2014 as the hottest year in the global climate record. And the departures were all quite strong with JMA showing +0.63 C, NASA showing +0.68 C, and NOAA showing +0.69 C above the 20th Century average — all measures that put the world now in the range of +0.9 C warming since the 1880s. Not only was this year the hottest on record for the global climate. It was one in many progressively hotter years and decades. The result being that if you were born in 1986, you haven’t experienced one month that has been cooler than the 20th Century average. It’s a set of validated evidence that is so obvious as to be incontrovertible. And yet the climate games and silliness still occur with regularity in the public sphere. In the most recent republican witching hour congressional approval of the Keystone XL pipeline — a piece of infrastructure that will shackle the US to climate-wrecking carbon emissions for decades to come — Bernie Sanders submitted an amendment asking republicans to record their climate change denial for the public record. A denial a majority of republicans, including most major party heads, now attest to, despite what the science is obviously saying. More notably, Senator Jim Inhofe, who currently sits as chairman of the environment and public works committee has publicly claimed that he believes climate change is a hoax. But what Inhofe doesn’t elaborate is why scientists who spend their lives in service to the public, and not to special interests, like the oil, gas and coal companies Inhofe often goes to bat for in Congress, would perpetrate such a hoax. Because if it is a hoax it is broad and all-encompassing — including every major atmospheric sciences body in the world today. In other words, if Inhofe believes NASA put a man on the moon, then why doesn’t he believe the same scientific body on the issue of climate change? Climate Scientist Michael Mann gave his own very clear take of the new record today on Facebook. Mann noted that the current new record, especially when viewed in context of the fact that we currently see no El Nino but still hit annual heat records, can put to rest the recent false assertions that atmospheric warming has paused. Based on the collective reports, it is therefore fair to declare 2014 the warmest year on record. This is significant for a number of reasons. Unlike past record years, 2014 broke the record without the “assist” of a large El Niño event. There was only the weakest semblance of an El Niño and tropical Pacific warmth contributed only moderately to the record 2014 global temperatures. Viewed in context, the record temperatures underscore the undeniable fact that we are witnessing, before our eyes, the effects of human-caused climate change. It is exceptionally unlikely that we would be seeing a record year, during a record warm decade, during a multidecadal period of warmth that appears to be unrivaled over at least the past millennium, were it not for the rising levels of planet-warming gases produced by fossil fuel burning. The record temperatures *should* put to rest the absurd notion of a “pause” (what I refer to as the “Faux Pause” in Scientific American: http://www.scientificamerican.com/article/earth-will-cross-the-climate-danger-threshold-by-2036/) in global warming. There is a solid body of research now showing that any apparent slow-down of warming during the past decade was likely due to natural short-term factors (like small changes in solar output and volcanic activity) and internal fluctuations related to e.g. the El Nino phenomenon. 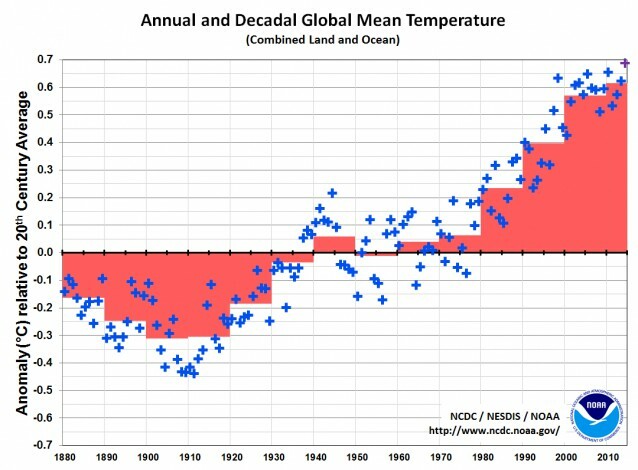 The record 2014 temperatures underscore the fact that global warming and associated climate changes continue unabated as we continue to raise the concentrations of greenhouse gases in the atmosphere. Mann was joined by lead NASA GISS scientist Gavin Schmidt who pointed out the inexorable global warming of ‘decades and decades.’ Schmidt noted that individual years rankings can be slung about through the forces of chaotic weather. But the trend, Schmidt asserted, was undeniable. Dr. Schmidt’s research has been critical in understanding the role of both CO2 as the primary governing gas impacting global heating as well as the amplifying heat of additional greenhouse gasses. In the late 1990s and early 2000s Dr. Schmidt provided critical evidence highlighting the atmospheric warming impact of methane, for example. The evidence is there. All of it. For any thinking person. The public-serving, and often conservative in their assessments, scientists keep making their warnings again and again like a collective modern Jeremiah. And yet we have one political party whose leaders simply refuse to listen to either facts or even the most basic reason. So in the face of such blantant and obvious denial of reality by the very people who are supposed to be responsibly leading our country, one must seriously consider the notion of running them out of office. Of stopping their legislative malpractice before it results in ever more serious trouble for us all. And not just for all the sakes of the scientists and those who believe them, but for the sake of the climate change deniers too. 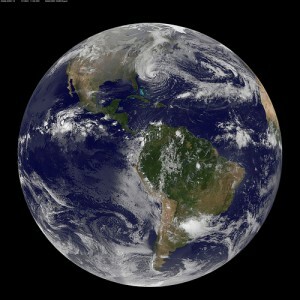 In a July 18 testimony to Congress, Dr. Jennifer Francis, an atmospheric scientist from Rutgers and key innovator to understanding how climate change has brought about dangerous alterations to the Northern Hemisphere Jet Stream, provides five compelling reasons why we should all be quite concerned about human caused global warming. 1. CO2 levels are higher than they’ve been in probably 2.5 million years. 2. The northern polar sea ice has lost more than 3/4 (80% ) of its volume since 1979. 3. The pace of sea level rise is accelerating. 4. The Arctic has warmed 2-3 times faster than the rest of the Northern Hemisphere. 5. Climate misleaders deliberately ignore and misconstrue the science. The video is well worth the five minutes it takes to watch. A more in depth PDF was also provided for those looking to dig deeper. Hat tip to Peter Sinclair for the heads up. An upper level low that originated this weekend west of the Appalachians has now transitioned all the way to the New Mexico, Arizona border. If it continues this motion, it will exit the continent somewhere near Baja or Southern California this weekend, having pushed over 3,000 miles against an extraordinarily week Jet Stream. Yesterday, a second low developed in the wake of the first over the southeast, slowly drifting east to west behind the first. Today, this double barrel retrograde system brought rains and localized flooding to a wide region including Florida, Georgia, the Carolinas, Texas, New Mexico and Arizona. Miami, which consistently suffers from flooding these days due to an antiquated water management system unable to cope with encroaching seas and more intense rains brought on by climate change, was blanketed by high waters. City offices handed out sandbags to residents who saw roadways, golf courses and yards disappear beneath the flooding rains. In Atlanta, warnings were issued as a local river approached flood stage and waters continued to rapidly rise as Houston experienced flooded roads and dangerous driving conditions. 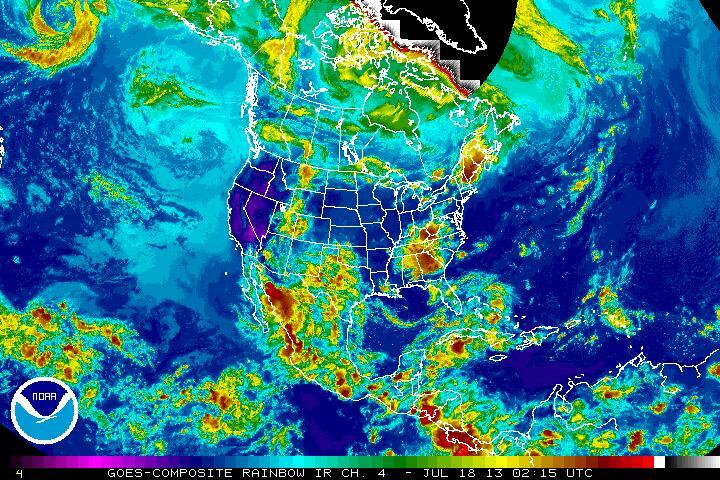 Less heavy downpours were reported throughout the Carolinas and into New Mexico and Arizona. 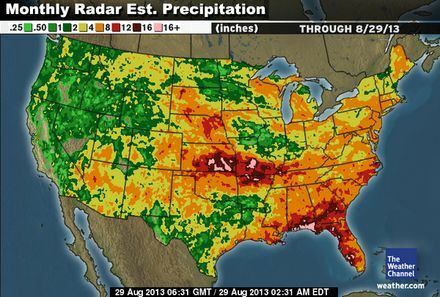 The western rains may be welcome, as they help to alleviate drought conditions that have lasted for more than a year. In the east, rainfall has saturated many areas causing added concern for what is expected to be a busy hurricane season. The first retrograde low can be seen moving into Arizona, the second is centered over Georgia, and another system looping over Maine and into the backward upper level wind pattern will potentially recurve into the East Coast over the next 36 hours. Dr. Jennifer Francis of Rutgers University has been presenting compelling research that shows that Arctic sea ice loss significantly affects the upper-level atmospheric circulation, slowing its winds and increasing its tendency to make contorted high-amplitude loops. Such high-amplitude loops in the upper level wind pattern (and associated jet stream) increase the probability of persistent (that is, longer-duration) weather patterns in the Northern Hemisphere, potentially leading to extreme weather due to longer-duration cold spells, snow events, heat waves, flooding events, and drought conditions. Given the strange backward moving weather events of the past week, weather system motion retrograde to typical upper level flows may also be a likely result. 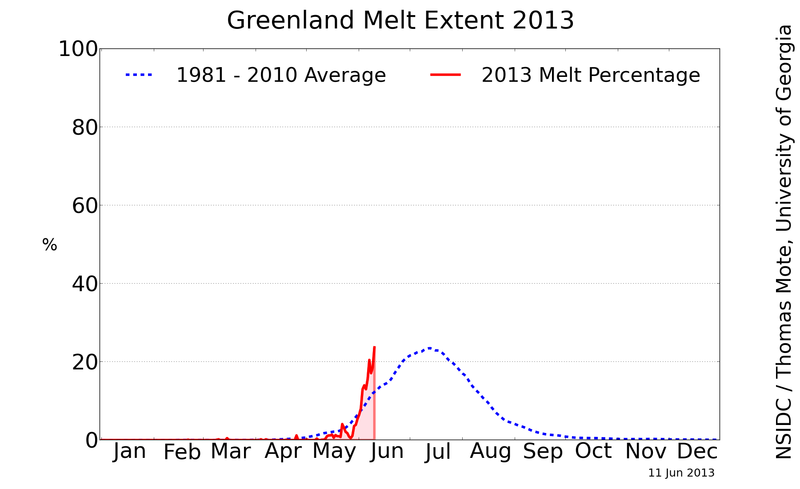 Greenland Melt Exceeds Summer Maximum in Early June. 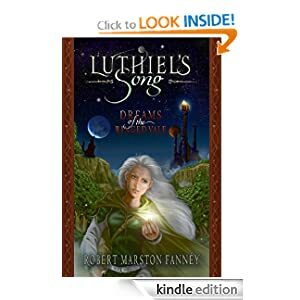 “Storms of My Grandchildren” on the Horizon? According to reports from NSIDC, Greenland ice sheet melt had exceeded average summer maximum values by Tuesday, June 11th, about a month and a half earlier than normal. On Tuesday, about 24% of the Greenland ice sheet had experienced melting. This value is about 1% higher than the usual summer maximum of 23% melt coverage. 2013’s early, widespread melt follows just one year after melt covered nearly all the Greenland ice sheet for days during July of 2012. 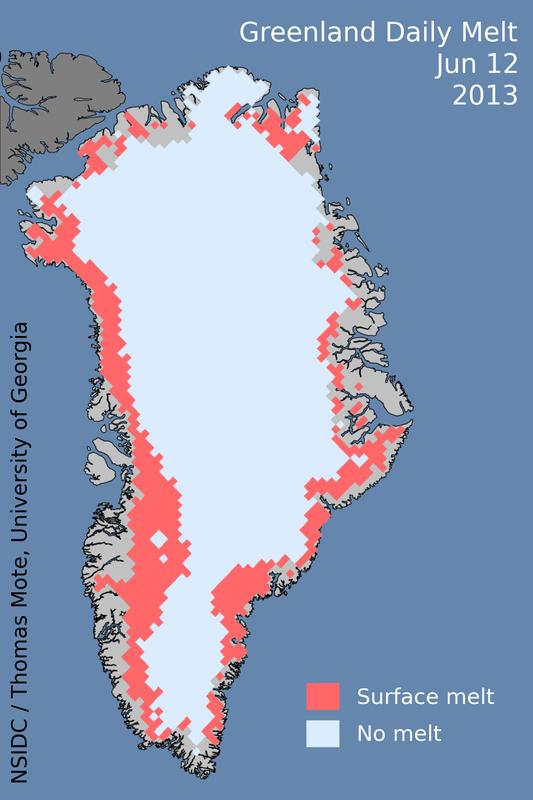 2012’s melt was the strongest for Greenland in at least 120 years. For 2013 melt values to approach or meet 2012 melt values would further reinforce a powerful increase in Greenland melt that has occurred since the 1990s. Since that time, the rate of Greenland melt has more than tripled. June 2013 has established a trend of rapidly increasing melt that sets in place conditions for past record values to potentially be challenged. As such, it is well worth monitoring conditions as they develop. Scientists now are at odds over how fast Greenland melt will increase. Some believe a linear increase in melt is most likely while others believe that exponential increases in Greenland ice sheet melt are not out of the question. Should the increasing pace of melt for Greenland continue, powerful changes in the weather, especially for Europe and North America are in store. This winter and spring’s extreme weather over much of Europe may just be a foretaste of what is to come. Massive melt from Greenland by or before mid-century means large volumes of fresh water in the North Atlantic. These high volumes of fresh water could substantially slow or even halt the Gulf Stream. Present measures of Gulf Stream circulation already show the current slowing. If these trends continue, the replacement of this warm water stream with cold water from Greenland will radically alter northern hemisphere weather. The Weather Channel provided a brief summary of some of the possible impacts of slowing Gulf Stream currents here. Even worse, under human caused climate change, a cooling of the North Atlantic occurs at about the same time tropical and temperate region temperatures begin to rapidly rise. This creates a high gradient between cold air near Greenland and warm air directly to the south. The result, according to models, is powerful storms never seen before in human memory. In “The Storms of My Grandchildren,” NASA scientist James Hansen warned of the potential for frontal storms large enough to span continents and packing the punch of hurricanes. Is is just these kinds of storms that rapid Greenland melt combined with intensified warming at the tropics could set off. The conditions for these events appears to be ramping up now and could be present, in the worst case, by as soon as the 2030s. In the meantime, weather conditions are likely to continue to deteriorate as a combination of sea ice melt and Greenland ice sheet melt play havoc with traditional weather patterns. Alterations to the Northern Hemisphere Jet Stream as demonstrated by the work of Dr. Jennifer Francis is one such change that is already present. And this alteration has already resulted in several instances of enhanced severe weather. Andrea’s formation in June continues a pattern of an unusually large number of early-season Atlantic named storms we’ve seen in recent years. Climatologically, June is the second quietest month of the Atlantic hurricane season, behind November. During the period 1870 – 2012, we averaged one named storm every two years in June, and 0.7 named storms per year during May and June. In the nineteen years since the current active hurricane period began in 1995, there have been fifteen June named storms (if we include 2013′s Tropical Storm Andrea.) June activity has nearly doubled since 1995, and May activity has more than doubled (there were seventeen May storms in the 75-year period 1870 – 1994, compared to 6 in the 19-year period 1995 – 2013.) 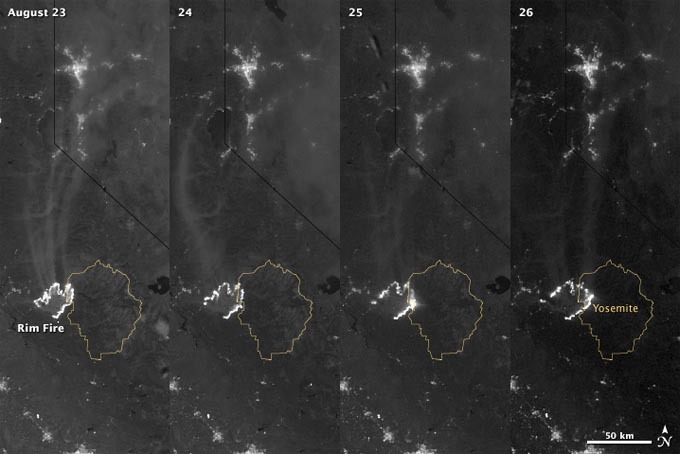 Some of this difference can be attributed to observation gaps, due to the lack of satellite data before 1966. So storminess increases at the tropics and storminess increases at the poles. When these two conditions meet, the potential exists for amazingly powerful and freakish storms similar to, but even worse, than Hurricane Sandy. It is the potential of global warming to set in place conditions where powerful storms can combine, persist, and expand over vast areas that is a threat we must consider as Greenland melt continues to increase, Arctic sea ice melt progresses, and warming in the tropics and temperate zones continues to expand. Over the coming weeks, you will hear any number of people trying to ‘normalize’ the unprecedented weather event that was Sandy. You will hear people trying to over-emphasize Sandy’s link to ‘natural climate variability.’ You will hear people claiming that extreme events like Sandy could have never been predicted. And you will hear people trying to take Sandy out of a context in which the US has just experienced its hottest year on record, is still experiencing one of its worst droughts on record, has just experienced its most extreme climate year ever, and during a year in which Arctic Sea Ice has melted to extreme record lows. And you should be assured — people taking Sandy out of a context of an ongoing string of extreme climate impacts as well as making these other assertions are entirely and completely wrong. Further, it is important to note that we were warned about the increased possibility of extreme storms like Sandy in the weeks and months before Sandy formed. A key ingredient that made Sandy so intense was not just the 5 degree Fahrenheit above average temperatures in the Atlantic Ocean off the East Coast. This five degree warming was fed by an increase of 1 degrees of average Ocean temperature warming over the past century, pushing the potential for extreme years higher. An overall warming directly fueled by human carbon emissions. 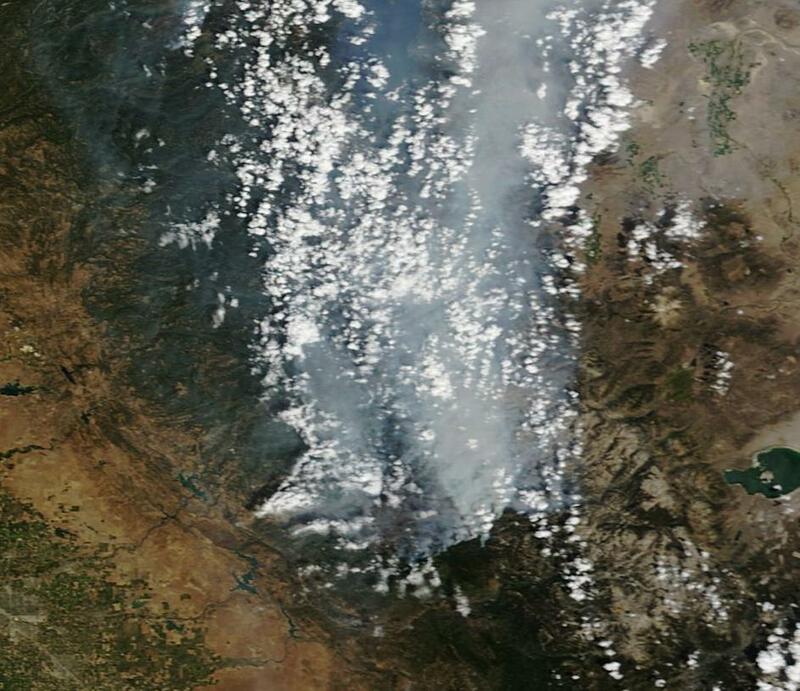 These increased temperatures and related increases in water vapor fueled Sandy, making her larger and stronger. These were clear global warming impacts that enhanced Sandy’s size and strength. But the kicker, the added boost that made Sandy a monster storm, the influence that pulled Sandy into the East Coast at such a destructive angle. That influence came from the Arctic. In the GOES image above, we can clearly see a long white arm of cloud stretching all the way down from the Arctic and into Sandy. This arm both greatly increased Sandy’s size and fed her strength through a mechanism called baroclinity. This mechanism fed Sandy’s strength not directly through heat energy alone, but through extreme differences in pressure and temperature. A hot core hurricane met up with a cold core Arctic front tapping the extreme cold air over Greenland. It was this combination of extremes that made Sandy far, far worse. 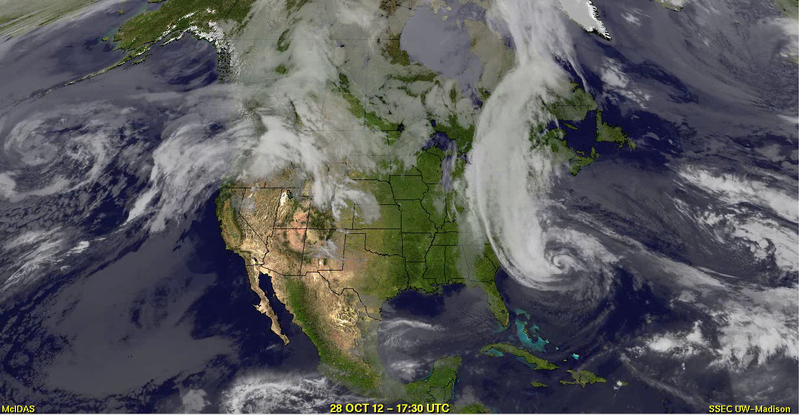 It was this Arctic Arm that pulled Sandy into the East Coast at the most destructive angle possible. Unfortunately, like so many other global warming Cassandras, these warnings went unheeded. A Presidential campaign in which Mitt Romney bragged about denying climate change and de-funding FEMA made mockery of the science and the altogether salient warnings. Such blindness during a year of record drought and Arctic Sea Ice loss is as inexcusable as it is criminal. Such inexcusable piggishness culminated in a Presidential debate in which Romney goaded Obama into arguing over who could increase drilling and, thus, fossil fuel emissions, the most. Then came Sandy and now all with eyes to see are able to bear witness to both the new potential for extreme weather and its Arctic Sea Ice melt enabler. At issue is the way receding Arctic Sea Ice erodes the circumpolar Jet Stream. This happens as warm air is drawn up from the south, slowing that air current down. The result is that huge wave patterns begin to appear in the Jet Stream. These waves draw warmer air up from the tropics in the south and pull cold air down from the Arctic. The blocking pattern also results in a more frequent negative Arctic Oscillation during the fall and winter months. This negative Arctic Oscillation is associated with extreme winter storms in both the US and in Europe and has been implicated in a number of extreme weather disasters over the past decade and a half. What happened this year is that withdrawing Arctic Sea Ice likely contributed to a very strong negative Arctic Oscillation occurring this fall. The result was a powerful blocking high pressure system over Greenland and an equally strong cold front pushing down from the Arctic. The fact that this happened at the same time Sandy was making her charge north is not simple coincidence. It is, in part, due to the loading of climate dice that resulted from these factors. First, we had abnormal late-season heat in the Atlantic fueling a powerful late-season hurricane. Second, we had an abnormally strong blocking pattern establishing early during fall rather than winter. The conditions were set for two powerful storms, should they arise, to come together in a dramatic way. The hot Atlantic Ocean was bound to brew up at least a few more hurricanes. Chances were some of these storms would track close to the troughs pushed south by the blocking Greenland high pressure. The receding Arctic Sea Ice was causing more and more strong cold fronts to charge south. Chances were that one of these might intersect with one of the northward-bound tropical systems. The deep dig of the charging cold fronts and the blocking high closing off any storm’s egress to the northeast made it increasingly likely that any merged hybrid would come ashore somewhere on the US East Coat. The chances for this set of conditions occurring without climate change eroding sea ice and heating the Atlantic are vanishingly small. But now, with the new conditions established, these events become more and more likely. At issue here is the fact that these conditions are established now. So we can expect an increasing chance for powerful hybrid storms like Sandy resulting from Arctic and tropical storm mergers as time continues, as Arctic Sea Ice melt intensifies, and as the Atlantic Ocean continues to heat up. This year was already the worst extreme weather year ever recorded. Fires, heatwaves, a monster Derecho and a devastating drought together would have made 2012 one for the record books. The one saving grace, it seemed, was that hurricane season hadn’t significantly added to an already severe problem. That was before Hurricane Sandy slammed into the US Northeast causing what many think will be in the range of 10-20 billion dollars in damage. If total damage estimates exceed 20 billion, Sandy will be one of the five most costly hurricanes in US history. Sandy was nothing if not unprecedented. Never has the Northeast seen this kind of storm so late in the season. Never has New York and New Jersey been subject to such a high level of ocean flooding over such a broad area. According to CNN’s chief meteorologist: “There’s no one that’s not 300 years old that has seen anything like this.” That’s just a finer way of saying that there is no record for a storm like Sandy ever occurring in this region of the country. And, in many cases, there’s no record for a storm like Sandy occurring period. What made Sandy so unique? 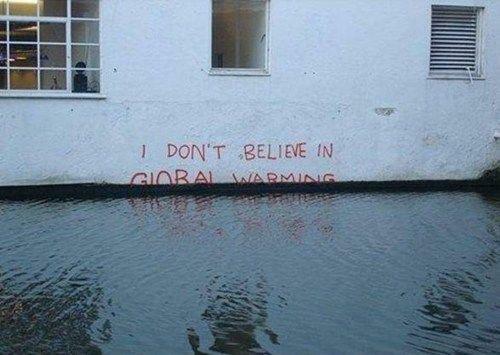 In two words: climate change. We’ve seen northeastern Atlantic Ocean storms where powerful troughs combine with hurricanes in ways that create a much stronger storm. The last time such a thing happened was during the 1991 ‘Perfect Storm.’ But that storm formed over the open waters of the Atlantic and only caused damage as it brushed New England with the powerful squall lines and heavy surf it cast off. In the case of Sandy, the Perfect Storm came ashore far further south and west than is usually possible. Since 1991, atmospheric changes and alterations to the Earth’s physical characteristics have been taking place that make storms like Sandy more and more possible. These ‘ingredients’ include increasing ocean temperatures, changes in the jet stream, and the receding boundary of Arctic Sea Ice. 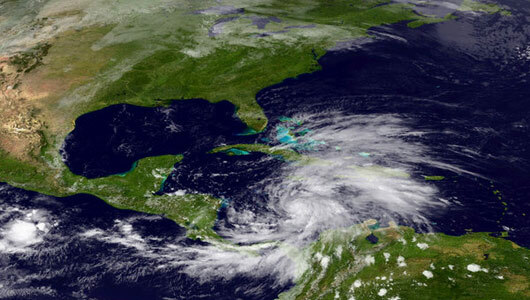 Like so many other hurricanes, Sandy was born of the tropical Atlantic. 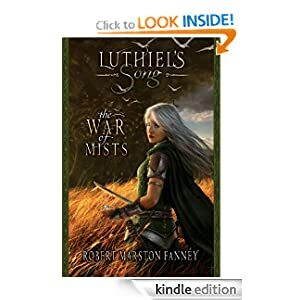 She started as a pulse of thunderous rain storms swirling off the coast of Africa. This tropical wave slowly gathered energy from the hot tropical Atlantic as she moved west, gradually twisting into the classic coma shape as she entered the central Caribbean. Ocean heat content for the South Atlantic and Caribbean was abnormally high this year. Most of this added heat content came from human caused global warming. In many regions, temperatures were 2-3 degrees above average. This meant that, for a storm like Sandy, these waters were about as warm as they would have been two to three weeks earlier during a typical season of the 20th century. This added energy increased the likelihood that the storm would form in the first place. It also gave the storm more capacity to strengthen even in an environment of increased wind shear. As Sandy tracked northward, she plowed through Jamaica and hopped over the eastern tip of Cuba. Maintaining significant strength as a category two storm, Sandy grew to a large size, boasting a tropical storm wind field in excess of five hundred miles in diameter. Hovering off the coast of Florida, Sandy was about to enter the second stage of her development. Two systems to the north would play key roles in Sandy’s growth and path. Both were products of new ‘blocking patterns’ that have emerged as regular weather events during the past decade. ‘Blocking patterns’ occur when the jet stream makes deep swoops down from the Arctic and into the mid and lower latitudes. These swoops make giant wave-like patterns in the jet stream. They also create a huge amount of atmospheric inertia. The result is that weather patterns tend to be more persistent. In the under-belly of a blocking pattern, one can expect abnormally hot and dry conditions to persist over long periods of time. In the frontal down-slope of the blocking pattern, one can expect abnormally cool, wet, and stormy conditions. The peaks of these blocking patterns tap the tropics and the troughs tap the Arctic. According to Dr. Jennifer Francis, these blocking patterns have emerged as a result of sea ice loss in the Arctic. The receding edge of the sea ice pulls air northward changing the shape of the jet stream from that of a rippling halo to that of a circle of sine waves. The new blocking pattern that had established itself over the central US allowed a powerful cold front to sweep southward, both lending energy to Sandy via strong temperature and pressure gradients and steering Sandy first northward, then pulling her in toward the Mid-Atlantic coast. A second aspect of the blocking pattern emerged in the form of a new high pressure system that has tended to form recently over Greenland. This particular high pressure system blocked the path of Sandy northeastward, shoving Sandy back up against the frontal trough that ended up lending her so much strength. As Sandy began to touch the trough’s strong, cooler winds, her tropical storm wind field spread out, eventually reaching 900 miles in diameter. In addition, Sandy found herself cloaked in the trough’s rain shield. This shield helped to prevent the worst effects of wind shear which, at times, was powerful enough to rip a normal storm apart. 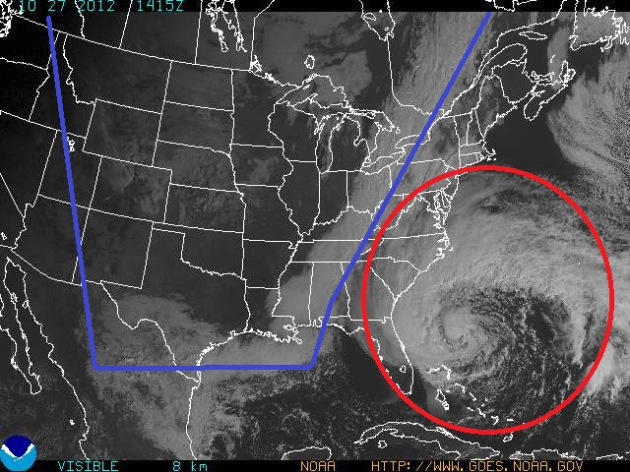 Sandy’s encounter with the Arctic-born cold-air trough caused her to explode in size and as she moved north, she pummeled the Outer Banks of North Carolina and Coastal Virginia from 300 miles off shore. What strength she lost at her core was multiplied manifold in the expanding reach of her effect. North Carolina and Virginia coasts experienced impacts usually reserved for those in the direct path of a Hurricane — powerful winds, heavy rains, and storm surge flooding. Roads were washed out, dunes were breached, homes were flooded. Water rises exceeded seven feet in some places. Yet Sandy was still hundreds of miles away, biding her time for the final rush to shore. And in this critical time period, global warming again played its hand. Sandy was now moving parallel to the Virginia coast. In normal years, water temperatures would begin to drop off here, sucking energy from the storm. This year, though, water temperatures had heated to 5 degrees Fahrenheit above normal through, the year after year, heat trapping effects of human emitted greenhouse gasses. Sandy drank deep from this added heat and, as the Arctic-born trough began to pull Sandy in to shore, she intensified. Maximum sustained winds reached 90 mph, tropical storm force wind diameter reached 1000 miles, hurricane force wind diameter reached 200 miles, and the pressure fell to an unprecedented 940 millibars. 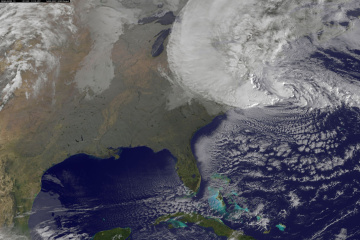 Sandy was now a storm for the record books. A storm that was the largest tropical cyclone ever to form in the Atlantic. A storm never seen before in this region of the world. A storm powerful enough to push ocean water nearly a mile inland up and down the Jersey coast. A storm mighty enough to create a nearly 14 foot water rise in New York City. Without climate change, the storm may not have formed in the first place, the storm probably wouldn’t have reached category 2 strength or grown to such a large size, the storm would have not combined with such a powerful trough sweeping so far south, the storm would have not been blocked from going out to sea by the new Greenland/Newfoundland high pressure, the storm would not have strengthened so far north over abnormally hot waters, and the storm would have not been pulled into the coastline by the powerful blocking pattern caused by melting sea ice. Sandy was, in all ways, the storm that climate change wrought. And since the pattern is now established for this kind of storm to happen now, it is likely that this kind of ‘300 year storm’ will happen again. Almost certainly with growing force and almost certainly within the next decade or two.